In DC Comics's current history of weekly series, for every standout, like the inaugural 52, there's been a clunker (Countdown to Final Crisis) and then some so-so ones along the way. Most recently I found Batman Eternal a tad convoluted, with overcomplicated layers upon layers in an attempt to pad the story out to the length a weekly series requires. I therefore did not have high expectations for, but was pleasantly surprised by, The New 52: Futures End Vol. 1. Rather in the vein of 52, Futures End follows a motley selection of characters to far off locations. The sheer variety of storylines keeps Futures End from retreading the same character beats over and over (for the most part); the writers even account the passage of time in the book, a nice touch for a weekly series. Though with an occasional stumble, there's strength of writing and strength of art here, and it comes together thankfully for an enjoyable weekly event miniseries. One of the first joys of Futures End, at least for a fan like me, is that it seems to seek to spotlight characters from the New 52's cancelled series. In pretty quick succession we get Stormwatch, Frankenstein, Amethyst, Firestorm, and Grifter, and just when I was thinking, "What would make this perfect would be ...," then sure enough, Voodoo is on the next page. Obviously this won't appeal to everyone -- by virtue of these characters' titles being cancelled ostensibly due to low sales, one could argue this is likely to appeal only to a minority of readers -- but I have a soft spot for these underdog characters and so this was a nice reunion for me. Of special note is co-writer Jeff Lemire not just penning Frankenstein again, but indeed Futures End brings back the whole aesthetic of the Frankenstein SHADENet caption boxes, a lovely touch. Indeed my guess is Futures End largely succeeds because it has only four writers, and strong ones at that: Brian Azzarello, Jeff Lemire, Dan Jurgens, and Keith Giffen (whereas Batman Eternal's writers seem to come and go maybe too swiftly). Lemire's hand is apparent in the Lemire-verse aspects of the story, and this specificity lends credence to Futures End as an actual future of the New 52: Frankenstein, but also his supporting cast like Father Time and Nina, the mer-woman; Emiko Queen and John Diggle, out of Lemire's Green Arrow run; Justice League United's Equinox; and Animal Man's touching speech about his friendship with Green Arrow. I imagine Jurgens in the story of the masked Superman, the Batman Beyond material, and perhaps Firestorm. Grifter's stranding on an island of mad science with a super-powered little girl named "Fifty Sue" is surely all Keith Giffen. Harder to place here is Brian Azzarello. I mostly think of Azzarello as a gritty crime writer, of which there's really none of in Futures End. There are Bat-characters present, but in a more superheroic vein than street-level Bat-shenanigans. And Wonder Woman, perhaps surprisingly, factors into the book almost not at all. My expectation -- based on their writing, not any knowledge of the writers' personalities -- is that Azzarello offers a calming presence on the story, injecting some reality, say, into Frankenstein, Amethyst, and Hawkman's imprisonment on a remote island inside a flying spaceship, and/or balancing out the book's (Giffen-lead, I presume) bwa-ha-ha moments. It's sometimes hard to care about characters in "alternate reality" stories, but setting Futures End five years into the future still with "our" characters worked better than I would have thought. Batman Beyond Terry McGinnis, from thirty-five years ahead, views it as the past, not the future, and that helps it seem less like a "future" story (where flying cars and other pseudo-future technology begins to seem hokey). With such a short time jump, many of the characters are still imminently recognizable, including the Earth 2 characters that cameo midway through. One welcome change, however, as evidenced in the funeral held for Green Arrow, is that five years in the future all the heroes know one another, and there's a greater sense of community than we have in the present-day DC Universe. It's been a while since we've seen a "crowd scene" funeral of this type and it was wonderfully nostalgic. Futures End buzzes along on a lot of fronts. It's great to see Lois Lane get some spotlight, and I was totally taken by the mystery of the masked Superman even as I kind of feel we've read such before. The use of Emiko Queen as the new Green Arrow, with Diggle, was again a great touch, and I was very interested in the history of the "Earth 2 war." The juxtaposition of a couple characters on Cadmus Island with these other characters way out in space gave the story a nice variety; in all Frankenstein, Amethyst, and Hawkman are a fun team, reminiscent of Adam Strange, Animal Man, and Starfire's own space-jaunt in 52. At the same time, for a 400-page book, it's understandable it might drag at times. The Grifter storyline starts out strong, but in the middle and end there's a lot of talk of Grifter seeking out metahumans with Deathstroke and Fifty Sue, but Grifter never actually gets out in the field; instead, the characters become occupied with "stealth OMACs" that they can't seem to find and are or aren't a big deal depending on the page. The Batman Beyond story, too, starts strong and then stalls for pages upon pages as McGinnis tries to convince criminals Key, Plastique, and Coil to help him and vice versa. The "space" characters take a jaunt through the Phantom Zone that serves really no purpose beyond filling an issue (though I see now how it offers a clue to the masked Superman's identity). But the most egregious problem with Futures End is in the writers' portrayal of Mr. Terrific Michael Holt. Futures End is supposed to be the future of "our" New 52 DC Universe, so the characters should generally in disposition be akin to the current portrayal, if aged. One of the key attractions of Mr. Terrific, from Geoff Johns's creation but especially in the New 52 iteration written by Eric Wallace, is that he transcends common comic book stereotypes as an African American man who's a respected scientist and the third smartest person in the world. That Terrific here is perhaps a semi-villain is surely explainable (including his collusion with Brother Eye); however, Terrific's faux "urban" speech patterns are not: "Hold up. Watch me trend," "Question my motives all you want, hater," "What he did to the cameras was pretty dope," and so on. The writers don't attribute slang to other characters -- Tim Drake, Lois Lane, Grifter Cole Cash, all of whom are Earth-born, non-"alien" characters -- but they do attribute it to Terrific, despite the fact that the character's very make-up and previous presentations suggest he specifically wouldn't speak this way. I felt the art came and went in Batman Eternal, but Futures End has a stronger, or at least more consistent or visually similar, lineup. I've been enjoying Patrick Zircher's work of late, and his is a moody, straightforward style that works, for instance, in the early Stormwatch sequences. Dan Jurgens is an always-welcome presence, even if his Grifter looks a bit too much like Booster Gold under the mask. Aaron Lopresti and Jesus Merino do equally well. At this point, as way leads on to way, I feel somewhat "over" New 52: Futures End, or at least I'm impatient for Futures End, World's End, and Multiversity all to go past so I can get to Convergence. 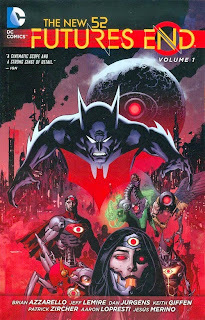 Futures End is good so far, however -- it most assuredly could have been worse -- and so not a bad appetizer, as it's turned out, before the main event. Actually, Azzarello wrote the scenes featuring Batman Beyond, Mr. Terrific, Plastique and a certain well-known character that joins the series starting next volume. His were usually my favorite segments in each issue, even though he didn't get Mr. Terrific's voice right. Lemire did an OK job with Stormwatch and S.H.A.D.E., and Jurgens's Firestorm, Tim Drake and Lois Lane subplots were mostly good with a few stumbles, but I really couldn't stand Giffen's Grifter/Cadmus/Fifty Sue material. As usual, I only can seem to enjoy his writing when someone else (preferably DeMatteis) writes the dialogue, which is why I'm glad Justice League 3000 survived the pre-Convergence purge.